START SOUNDING YOUR BEST RIGHT NOW. Request your complimentary downloadable e-booklet. WHAT IF YOU COULD CONSISTENTLY MAKE A POSITIVE FIRST IMPRESSION IN YOUR DAILY INTERACTIONS? You can with this invaluable booklet filled with Dale Klein's guidance. 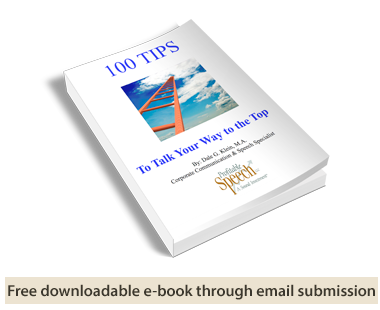 "100 Tips to Talk Your way to the Top"
You'll also receive suggestions on how to optimally use your booklet as well as how to create a personalized action plan! This powerful booklet is yours as a complimentary download! Yes, please email me my complimentary download "100 Tips to Talk Your Way to the Top"